All Natural, Hand Made Mustard from Naples Valley New York. 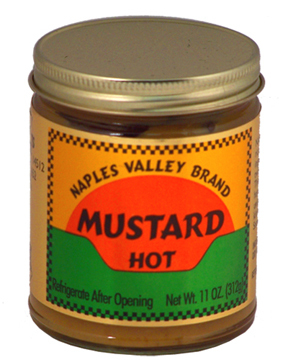 If you like your mustard hot, then you have to try Naples Valley Brand Hot Mustard. It is a rich, high quality mustard with no artificial ingredients or preservatives. This hot version is packed with intense peppery flavors, giving it a spicy, bold taste. Naples Valley Gourmet Mustard is the perfect addition to spice up any party, but is also great to have around everyday to enhance the flavor of your favorite foods. It is made by hand daily using only fresh, all natural ingredients. You will find that it tastes amazing, and is an intensely flavorful mustard. It is excellent on hot dogs and sandwiches, but you can also use it as a glaze for ham, or as a tasty dip for veggies, chips, pretzels and more. Spread it on crackers the next time you are snacking to give your cheese and crackers a kick of flavor. This is the perfect gift for all those mustard lovers out there, but makes a great addition to any fridge. You are viewing the hot variety mustard, but we also carry the champagne garlic version too. Click here for details. Choose a healthier, hand crafted mustard with outstanding flavor. 10 oz. Naples Valley has been making quality gourmet mustardsby hand for over 15 years. Each variety is made in small batches to ensure that only the highest quality ingerdients are used. This results in an incredibly fresh tasting, and healthy product. There are no preservatives, and each line features 100% natural ingredients. Naples Valley Brand produces a complete line of jams, barbecue sauces, rubs, spice mixes, marinated garlic and stuffed olives. Each and every one is made using the same commitment to wholesome goodness that has made Naples Valley Mustard such a hit with so many families! Order Yours Today! Ingredients sugar, eggs, vinegar, dry mustard, spices. Gourmet Hot Mustard by Naples Valley Brand - Hand crafted for an irresistible gourmet taste. This all natural gourmet mustard will greatly enhance all kinds of food. The perfect gift for all those mustard lovers out there.